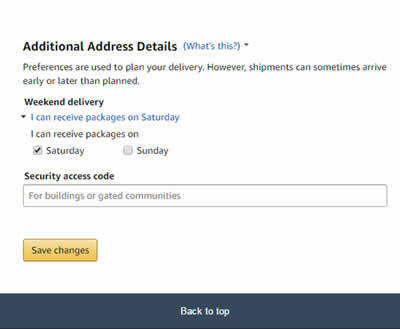 QUESTION: HOW DO I MAKE SURE MY AMAZON PACKAGE IS DELIVERED TO A SECURE LOCATION? ANSWER: INSTRUCT AMAZON TO DELIVER YOUR PACKAGE WHEN AND WHERE YOU WANT. Amazon (per contract with USPS) instructed the Post Office (USPS) to leave Amazon packages outside the front door of a closed business on weekends, particularly on Sundays. Log in to your Amazon.com account. Click on Account & Lists. Click on Addresses (sign in if needed). For each address, click Edit at the bottom of the box. Scroll down to Weekend Delivery and click. Concerned about packages being stolen from your residential front porch or mailbox? Open a private mailbox at Pak Mail. We will email you when a package arrives and keep it secure until you claim it.